If you're a fan of Alternative rock then you'll sure not want to miss this one!! Two of the biggest are joining forces for next Summer as they hit up venues across North America! Legendary 80's-90's, Pixies and the 90's, Weezer! Treat yourself with tickets to the show of the year, both of them LIVE at The Forum on Wednesday 8th August 2018! Escape to your happy place with a night of excitement and awe-inspiring entertainment – you're worth it! 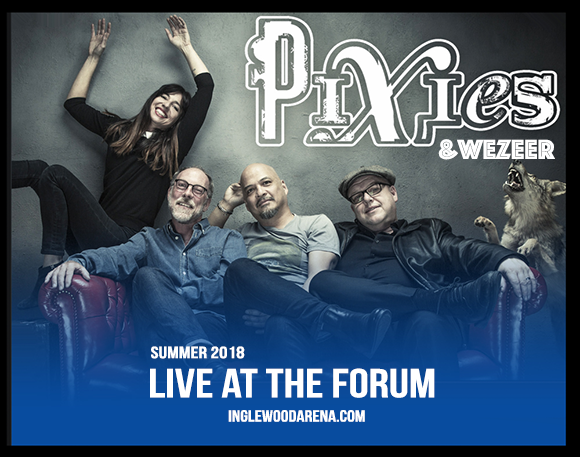 Get your Weezer & Pixies tickets today!! American rockers, Weezer kicked started their career in Los Angeles all the way back in 1992, as the members formed the group; Rivers Cuomo on lead vocals, lead guitar, Patrick Wilson (drums), Brian Bell (rhythm guitar, backing vocals, keyboards), and Scott Shriner (bass, backing vocals). These guys have been a big part of modern day Alternative Rock, with their popular singles including "Buddy Holly", "Undone – The Sweater Song" and "Say It Ain't So" – all off of their triple-platinum record, Blue Album. Which along with their second release, Pinkterton, have been placed in the top albums of the entire 1990's on more than one occasions and have influenced so many artists on the similar scenes. With their sound bringing out a few different elements through the years, Weezer have been known to cross the Rock genre with pop on songs such as "Hash Pipe" and "Island in The Sun" – all have a upbeat feel to them. Join them as they take to the road in Summer 2018 for a tour with i'm sure one of their influences like so many the – Pixies! The Pixies hardly need an introduction as one of the most influential alt-rock bands to have formed in the mid-late 1980's. Led by the one and only – Black Francis (lead vocals, rhythm guitar) and including; Joey Santiago (lead guitar), Kim Deal (bass, backing vocals) and David Lovering (drums). With a line-up that has changed and developed through the years, so has their sound and this is another group that likes to combine and break the boundaries; psychedelia, noise pop, hard rock, and surf rock. Pixies have majorly influenced bands such as Nirvana, Radiohead, the Strokes, Bush, Blur and More!